Individuals need to be educated in personal health and wellness to maintain their quality of life. Healthcare specialists address issues such as substance abuse, mental illness, and sexually transmitted diseases to help individuals and communities stay healthy. Community outreach leaders advocate for health programs and provide education and support for local residents. The Bureau of Labor Statistics projects the number of health education positions to increase 16% by 2026, a rate much faster than the national average for all occupations. Health education professionals work in healthcare facilities, schools, nonprofit organizations, and businesses. Health educators positively impact others' lives and ensure the continued health of communities. Professionals with an online health education degree provide quality healthcare and education. While pursuing a health education degree online, students gain interpersonal communication skills and become proficient in statistical analysis. Graduates are equipped to construct healthcare plans that improve the quality of life for communities. Most health education programs include courses in lifespan wellness, communicable diseases, and social and behavioral health. Students explore the social and cultural divisions that impact lifestyles and learn about past and present approaches to personal and community health issues. Additional coursework in program management, statistical analysis, and healthcare marketing train students in the administrative and analytical components of the industry. After earning a health education degree online, many graduates pursue careers in healthcare facilities, where they work with patients and family members to establish healthy lifestyles following release from hospital care or assisted living. Educators work in schools to combat issues such as substance abuse and sexually transmitted diseases. Health educators often collaborate with public health administrators to spread awareness of community issues and during healthcare emergencies. University of Florida ranks #1 on The 8 Best Online Bachelor's in Health Education Programs! Based in Gainesville, UF offers a variety of online bachelor's programs, including a bachelor of science in health education and behavior. This program prepares students to promote healthy lifestyle choices among individuals and communities in clinical and workplace settings. Graduates pursue careers as family life educators, drug rehabilitation specialists, and public health information officers. Full-time students can complete the 120-credit asynchronous online health education degree in four years. Required courses and electives provide a foundation in the social and biological sciences. Core courses include anatomy, physiology, biology, nutrition, statistics, psychology, and sociology. Critical tracking courses ensure students progress systematically through the program. After completing coursework, students spend the final semester undertaking a 15-credit full-time internship. Transfer applicants should have a 2.0 GPA. Students must complete at least five of the nine prerequisite courses with a 2.5 GPA. The University of Florida receives regional accreditation from the Southern Association of Colleges and Schools Commission on Colleges (SACSCOC). Brigham Young University - Idaho ranks #2 on The 8 Best Online Bachelor's in Health Education Programs! BYU-Idaho is a private university affiliated with the Church of Jesus Christ of Latter Day Saints. The school offers an online BS in public health that focuses on health education and promotion. Students in the online health education degree complete 40 credits of comprehensive general education coursework. These foundational classes include quantitative reasoning, writing, science, and cultural awareness, and religion. Students earning their health education degree online develop core competencies in the field and are prepared to obtain the Certified Health Education Specialist credential. The curriculum includes 52 major credits in areas such as health behavior theories, hospital and health administration, and international health. Students also complete 28 elective credits and an internship. Distance learners complete coursework asynchronously, but assignment deadlines and exam dates follow the same schedule as the on-campus program. Students communicate with peers through online discussion boards. Brigham Young University – Idaho receives regional accreditation from the Northwest Commission on Colleges and Universities (NWCCU). Arizona State University - ASU Online ranks #3 on The 8 Best Online Bachelor's in Health Education Programs! ASU offers more than 150 online degrees and certificates, including an innovative BS in health education and health promotion. The online health education degree prepares students to earn the Certified Health Education Specialist credential. Students complete foundational courses in social determinants of health and health behavior, clinical informatics, and stress management for wellness. Distance learners then customize their degree through electives such as social media and marketing in health education and emotional health and interpersonal relationships. The program culminates in a six-credit capstone internship. ASU offers six start dates per year. Online students have access to resources including tutoring, career services, military support, and libraries. The program requires 120 credit hours. Each course lasts seven and a half weeks. Arizona State University Online receives regional accreditation from the Higher Learning Commission of the North Central Association of Schools and Colleges (HLC). Touro University Worldwide ranks among The 8 Best Online Bachelor's in Health Education Programs! TUW delivers fully online programs from its base in Los Alamitos, California. An innovator in online education, TUW created the first regionally accredited online doctoral program with no residency requirement. The university's BS in health sciences with a concentration in health education emphasizes intellectual rigor and commitment to social justice. TUW's online health education degree features small class sizes. Students gain practical skills by examining case studies. The program requires 120 credit hours and full-time students typically earn the degree in three and half years. Students prepare to become Certified Health Education Specialists through courses exploring teamwork, cultural competence in healthcare, and policies and ethics in healthcare. The program culminates in a three-credit capstone project. Students must complete prerequisites before moving on to major and concentration requirements. TUW is part of the Touro College and University System, which enrolls 19,000 students worldwide. Touro University Worldwide receives regional accreditation from the WASC Senior College and University Commission (WSCUC). University of Arkansas at Little Rock ranks among The 8 Best Online Bachelor's in Health Education Programs! Founded as a junior college in 1927, UA Little Rock now offers more than 100 undergraduate degrees, including an online BS in health education and promotion. The online health education degree requires 120 credit hours, which most students complete in four years, and follows a traditional, semester-based schedule. Students complete 32 credit hours in core coursework and 67 credit hours in areas such as mental health education, controversial issues in health education, and cultural competence in health education. Health education students must declare an 18-hour minor in an area such as psychology, health science, health and exercise science, or sport management. All students complete a six-hour supervised internship in a health education setting. The program culminates in a health sciences capstone seminar, during which students create a portfolio to prepare for the Certified Health Education Specialist exam. Online students have access to resources including the library, an online writing lab, and military student support. Applicants must have a 2.0 GPA and at least 12 previous credit hours. The University of Arkansas Little Rock Online receives regional accreditation from the Higher Learning Commission (HLC). University of Louisiana at Lafayette ranks among The 8 Best Online Bachelor's in Health Education Programs! Founded in 1898, UL Lafayette is one of the most affordable universities in Louisiana. The university offers a BS in kinesiology with a concentration in health promotion and wellness. Program requirements include a nine-hour internship, a three-hour clinical experience, and a first aid course. The curriculum also includes nine hours of coursework in nutrition. Because many graduates pursue careers with nonprofit organizations, the program provides skills in organizational leadership, management, and organization funding strategies. This online health education degree requires 120 credit hours, which most students complete in four years. Graduates are prepared to sit for the Certified Health Education Specialist exam. UL Lafayette delivers online coursework asynchronously, so students can complete requirements on their own schedule. All online students pay in-state tuition rates, regardless of residency status. UL Lafayette is not authorized to offer the BS in kinesiology to students in all states; be sure to check your state's eligibility before applying. The University of Louisiana at Lafayette receives regional accreditation from the Southern Association of Colleges and Schools Commission on Colleges (SACSCOC). Southern New Hampshire University ranks among The 8 Best Online Bachelor's in Health Education Programs! SNHU structures its online programs to meet the needs of busy students with personal and professional commitments. Based in Manchester, SNHU enrolls more than 80,000 online students across the country. The university delivers its BS in community health education asynchronously, allowing students to complete coursework at their convenience. The curriculum covers topics such as wellness across the lifespan, methods and materials in health education, health communication, social marketing, and advocacy. The program culminates in a community health capstone, which requires a comprehensive paper. SNHU offers six start dates throughout the year, and full-time students can complete the health education degree online in four years. SNHU makes admissions decisions on a rolling basis. Discounted tuition rates are available for U.S. service members. Transfer students can apply up to 90 previous credits toward the degree. SNHU does not charge an application fee. Southern New Hampshire University receives its regional accreditation from the New England Association of Schools and Colleges (NEASC). 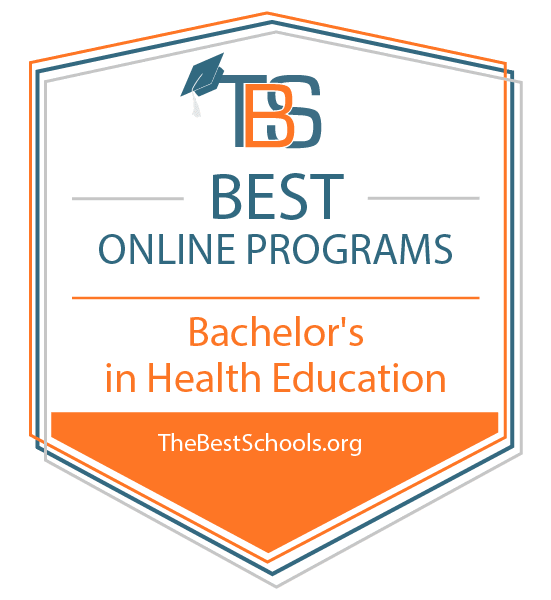 Mississippi University for Women ranks among The 8 Best Online Bachelor's in Health Education Programs! In 1884, The W became the country's first state-sponsored college for women. Today, the university admits both men and women to its on-campus and online programs. The W offers two online health education degrees: a bachelor of science in public health education and a bachelor of applied science in public health education. Both programs require 124 credits, which most students complete in four years. The programs are available fully online, with the exception of an optional six-credit internship. Online students can complete a capstone research project in lieu of an internship. The curriculum includes coursework in the humanities, critical thinking, global health, and chronic and infectious diseases. Applicants to the BAS program must hold an AAS in allied health. Transfer students in the BS program may apply up to 62 previous credits toward the degree. Mississippi University for Women receives its regional accreditation from the Southern Association of Colleges and Schools Commission on Colleges (SACSCOC). Earning a degree in health education online prepares students for a variety of careers, such as those described below. Some graduates work with patients in healthcare facilities, while others pursue government positions and make large-scale changes. Health educator and community health worker: These professionals work directly with patients in healthcare facilities and hospitals. They meet individually with clients and family members to explain diagnoses, organize health screenings, and discuss ways to maintain healthy lifestyles after release from professional care. High school health educator: These educators help young adults make responsible decisions that positively impact their futures. They prepare students to address issues such as substance abuse and sexually transmitted diseases, and they convey the benefits of exercise and mental health awareness. Social and community service manager: Social and community service managers work with the local government to identify, analyse, and address community health needs. Through outreach engagement, these managers communicate with the public and address community health issues.